M2S/M3M 18” Hydraulic Vertical Miter Band Saw s/n D-1162. Marvel mdl. 8/M8/M4/M3/S Vertical Miter Band Saw s/n 810708. Marvel Series 15A 15” Horizontal and Saw (Needs Control Work). DoAll 12” Automatic Horizontal Band Saw. Promacut/Trennjaeger mdl. LPC110/400 Hydraulic Miter Saw s/n GH1472. DoAll mdl. 2013-V 20” Vertical Band Saw s/n 457-901590. (2)Powermatic mdl. 87 20” Vertical Band Saws w/ Blade Welders. Sullair LS-10 40Hp Air Compressor. Tarasconi 8 1⁄2’ Hydraulic Press Brake w/ Manual Back Gage. DiAcro mdl. 16-72 72” x 16GA Press Brake s/n JE-1001. Roper Whitney mdl. 812 8’ x 12GA Hand Brake s/n 522-5-76. DiAcro 48” Finger Brake s/n 102081. Wabash mdl. 4-MIL-2218-5TX Mulit-Platen Hot-Cold Press s/n 6716-4. Wabash mdl. PC30-15-4TM 12,000 Watt Dual Platen Press s/n 5022. Cincinnati 32” Heavy Duty Shaper Machine. s/n A1123 w/ Elevated Stand. Aggreko Portable Air Compressor (Burned Motor). (3)Aggreko 30-Hp Portable Cooling Units. (2)DuroPower 33.5 kW Standby Generators 240/120V (Needs Controls). Cincinnati Gilbert Horizontal Boring Mill s/n 281 w/ Trak DRO, Power Feeds, 43” x 79” Table. Bridgeport Series 1 – 2Hp Vertical Mill s/n 221468 w/ Chrome Ways, Power Feed. 48” Table. Bridgeport Vertical Mill s/n 128128 w/ Sargon DRO, Chrome Ways, Power Feed. (4)Bridgeport Vertical Mills s/n’s 138726, 87762, 58824, 68992. 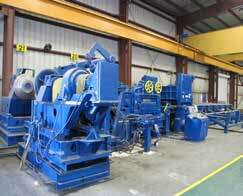 Lagun FTV-2 Vertical Mill s/n 16408 w/ Chrome Ways. Gorton “Trace-Master” mdl. 1-22 Tracer Mill s/n 38692. 30-1500 RPM. SIP Type MP-3KBridge Style Jig Boring Machine s/n 4702. 1996 Matsuura RA-III F 2-Pallet CNC Vertical Machining Center s/n 9605011942 w/ Matsuura/Yasnac System i-80 Controls, 30-Station ATC, 40-Taper Spindle, 7500 RPM. 1995 Matsuura RA-III F 2-Pallet CNC Vertical Machining Center s/n 950511425 w/ Matsuura/Yasnac System i-80 Controls, 30-Station ATC, 40-Taper Spindle, 7500 RPM. Kasuga “Quantum” Q-NC3H-43 3-Spindle CNC Vertical Machining Center s/n Q9120236 w/ Fanuc Controls, BT-40 Spindles, 7500 RPM. Matsuura MC-760V-DC Twin Spindle CNC Vertical Machining Center s/n 85052717 w/ Fanuc 6M Controls, (2)25-Station ATC’s, 40-Taper Spindles, 4000 RPM. Matsuura MC-500VS-DC Twin Spindle CNC Vertical Machining Center s/n 85034626 w/ Yasnac MX2 Controls, (2)20-Station ATC’s, BT-35 Spindles, 10,000 RPM. Kitamura MyCenter-1 CNC Vertical Machining Center s/n 01373 w/ Fanuc 3M Controls, 16-Station ATC, BT-35 Spindle, 10,000 RPM. Lagun / Trak FTV-2S 2-Axis CNC Vertical Mill s/n 22792 w/ Trak Controls, 50-4500 RPM. Lagun / Trak 2-Axis CNC Vertical Mill s/n 20632 w/ Trak Controls, Power Draw Bar, 50-4500 RPM. Bridgeport Series II CNC Vertical Mill s/n T399 w/ Bridgeport Controls, 40-Taper Spindle. Hurco CNC Vertical Mill w/ Hurco SM-1 Controls. Star JWC-16 CNC Screw Machine s/n 046086 w/ Yasnac Controls, (2)3-Station Turrets, (3)Drill Stations. Mori Seiki SL-2A CNC Turning Center s/n 1190 w/Yasnac Controls, 12-Station Turret, 3000 RPM, 8” 3-Jaw Power Chuck, 5C Collet Nose.